← A Calligraphy Workshop at Jewels. I strongly suggest that beginners read this post first and then click on Lesson One. Familiarise yourself first with the Roundhand alphabet. I am sure it will save a lot of heartache later. Firstly, there are so many products on sale, all purported to be the must have for the budding scribe. For the time being, my advice is to forget all that. Keep it simple. Buy or make only that which you need to get through the next stage in your journey. All the pens and brushes in the whole wide world are of no use if you have no idea what to do with them. If you follow the Calligradoodles videos and use the worksheets that go with them, you will notice that all the elements are made up of pencil marks on paper. So, all we need to get started, is a sheet of ordinary copy paper, a ruler and two pencils joined together with elastic bands. ( Better than tape when it comes to sharpening ). A board of some description propped at an angle of about 20 degrees on your table, or even on your knees ( Not good for the back! ), will be enough for the first few sessions. So, now you are able to construct a half decent Roundhand and Roman alphabet and are ready to progress. You will need a pen and some ink, and once again there are so many products out there that confusion can easily set in, so simplicity is best. A fountain pen set with 4 – 6 nib sizes and a good supply of cartridges or ink is a good addition to your tool-box at this point. A couple of pen holders and some broad nibs plus a bottle of black calligraphy ink ( not waterproof, this will easily clog your nib ). Here I shall make no apologies for directing you to Bill’s Art and Calligraphy Supplies I do earn a small commission from Amazon on any sales, But please don’t feel that you have to buy here. The main reason for setting up this A Shop was to illustrate the mind boggling choices we have just in this one discipline. The Book Section is mind blowing! If I can raise a few pennies to offset expenses, thanks for your custom. The Technik Art Layout Pad A/3 is a handy addition right now. Only 50 gsm means you can make one guideline sheet and lay it under each page. A good tip at this point is to rule lines at 1/8″intervals from top to bottom of that page. If you do this in landscape format it will be much more versatile. When laid under the actual working page it is easy to mark an X over 1,2,3, or however many lines it takes to make up the x height needed for the particular nib size you are using. This will stand you in good stead for the rest of your life. If you do have to draw lines, always draw them in multiples of 1/8″ according to nib size. More on this as you progress. The Brause assortment calligraphy set or William Mitchell right hand italic set. ( There are left hand versions available, and you will find a really good book for Lefthanders in the book department ). ( See also The Left-handed Calligrapher, here at Bill’s Space, and for more support and info try the Facebook group, Calligraphy for the Left Handed ) . The Manuscript Leonardt Calligraphy dip pen nibs – Italic and Poster set, is particularly good value. A bottle of black Manuscript ink or set of three, black, gold, red, W & N inks will keep you busy for a while. A better quality paper is now needed to show off your new skills so a pad of Daler Rowney A/3 might be your next choice. Why A/3? Simply, this size gives more scope for layouts. If you need a smaller format, it is no problem to cut a page. For line drawing, a Rowney or any of the many boards or drawing machines available will make life a bit easier, but I find a set square running along a 2 foot ruler taped to my board is quite sufficient. Incidentally, I use a home made light -table whenever possible. If you try this, PLEASE USE ONLY TOUGHENED GLASS.There is a commercially made Artograph box in Bill’s Art and calligraphy supplies. A “T”-square is a handy addition and perhaps a few basic drawing instruments next. You see. Your collection is building up already. But only with stuff you use. Not just stuff! 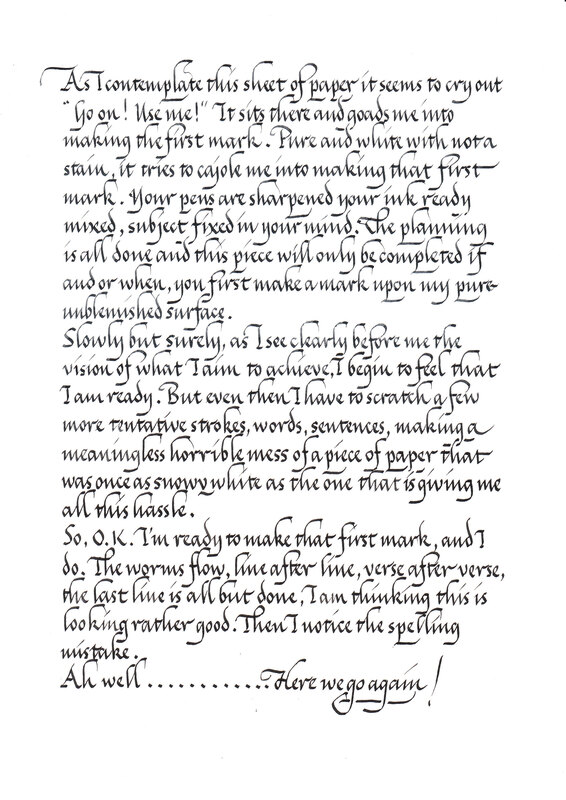 Scribblers have kindly issued 50 calligraphy tips You might find these useful. By the way, when conducting a workshop, I usually ask participants to bring with them the following articles if at all possible. Calligraphy ink. NOT WATERPROOF. Avoid Indian ink whether waterproof or not. 2, HB and I, 2H pencil. A 00 paint brush. A cheap brush for mixing. A palette or saucer. A jar for water and a kitchen roll. If you have problems obtaining any commercially marketed equipment, You might try going back to basics and making your own. 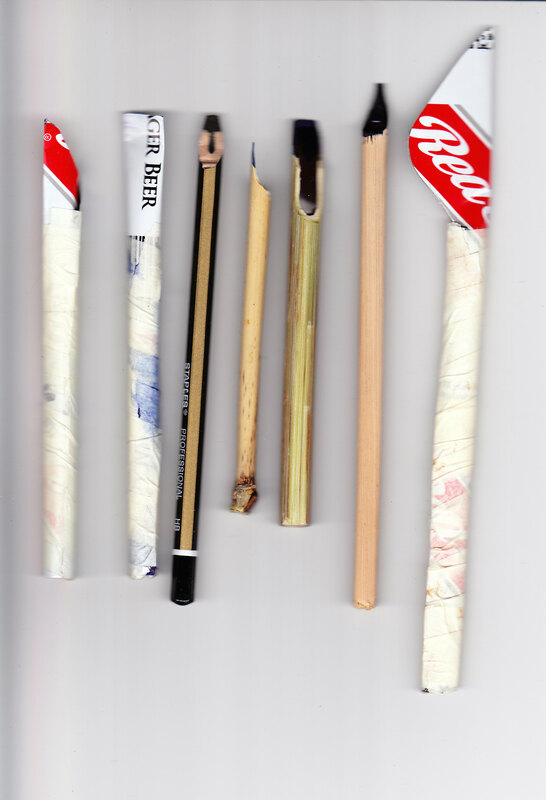 It is a good idea anyway to experiment with quills, reeds, bamboo, tin cans etc. My take on the Cola pen. The RED STRIPE Pen. To my mind, much more fun emptying the can. A chisel cut pencil to dip. A needlepoint and 6mm with film reservoir. Bamboo, and a 2mm Reed. Make sure mummy and daddy are supervising. Heheh. We don’t want any cut fingers! With scissors, cut top and bottom from the can, making sure you have first downed the contents. (Adults, it might be best to leave this stage ’til tomorrow, depending on the strength of the aforesaid). Carefully, (The cut tin can will be very sharp). Open up and then fold down the length of the metal. Cut whatever shape you are looking for for the nib…then continue down the length,making sure to leave enough for the handle. This is rolled and then taped tightly. Perhaps strengthening by rolling the handle round a pencil. You could make a much prettier job by soldering.Just make sure that all bare edges are covered or blunted. ‘speriment and enjoy. You might like to note that I have been experimenting with various materials to use as reservoirs. The best so far is old fashioned film or even negatives. Used flat it can be cut and pushed into a slit formed in the quill, reed, bamboo or whatever, or rolled into a spring and pushed into the aperture. Now may I suggest that you join Lesson One. If you have any problems, questions, advice, etc., do not hesitate to use the comment boxes throughout this site. If I don’t know the answer, I’m sure to know someone who does. I hope you get as much enjoyment as I do from making good letters. This entry was posted in ,calligraphy,calligraffiti,lettering, how to, Beginners, Calligraphy Supplies., calligraphy tools, Cola pen, light table and tagged Beginners, calligraphy, Learning, lettering, light table. Bookmark the permalink. Wow, I’ve never seen a soda can nib, how fun! Have fun designing a pen that suits you. Be careful of sharp edges though. Your blog will be very useful for our pointed pen beginners. It is my pleasure. I am glad you are finding it interesting. I enjoyed looking through your posts. I have been a calligrapher for about 35 years (and calligraphic engraver for nine) and was approached to teach a brief class this summer to elementary students. Each class is about 45 minutes long and I’ve been told they want a demonstration followed by time for the kids to practice. Do you have any brilliant ideas? I’ve taught adults before but my challenge this time is that many of these kids have not yet mastered their OWN handwriting skills! Thank you for any light you can shed on this situation! Heheh! You have found yourself in a very difficult situation. I also have been asked to do something similar for a local Guide / Brownie group but have decided that 45 minutes is just not long enough to do justice to the subject. OK if you are going to have follow up sessions but not a one off. Here is one with 15 / 16 year olds that took twice as long and was still a bit of a rush. For youngsters it might be an idea to draw out a large banner on lining paper then ask them to put on some colour. This seems always to go down very well and for some, it might just stick in the mind and bloom in the years to come.